As she starts her journey into becoming an octogenarian this April, this "unpretentious doyenne of Bharatanatyam (India Today, 1999)" has seen Bharatanatyam's history first-hand. Through her own life and times, she saw the temple dance come out of its fading lights into the arc lights of big cities and also films. She was a witness to, and part of, many an interesting twist and turn in the fortunes of the form and yet remains an egoless practitioner, long-term watcher and quiet servitor of the divine art. That she herself danced for almost 60 unbroken years (1940-2000), makes her a very significant source of direct dance history of the form. Born on 7th April, 1931, in Madras (hence Madras Kadiravelu Saroja), she was spotted by Guru Muthukumaran Pillai, when he came to Madras to teach Sadir dance to girls in big cities, hailing from established families. His own sister was a dedicated devadasi at a temple in Kattumannarkoil in the Tillai region, not far from the famed Chidambaram, where Lord Shiva danced. 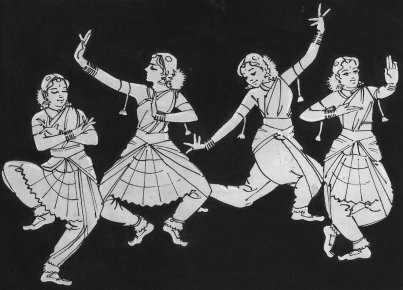 The vidwan had taught many boys in his village the art of dance and nattuvangam, amongst whom, were also Ramaiah Pillai, Kunchidapadam Pillai and Muthuswami Pillai. Though the guru trained Ram Gopal, Mrinalini Sarabhai and Kamala Laxman, he took Baby Saroja, as she was soon to be called, everywhere, almost as a prized-pupil to show others what the art was. 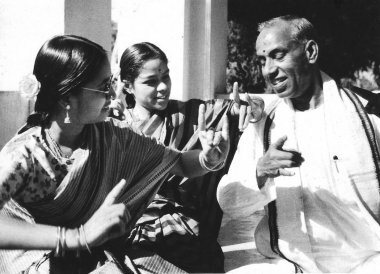 Thus, when Rukmini Devi started Kalakshetra and needed a dance teacher, the first one to be appointed was Guru Muthukumaran Pillai and he took Baby Saroja, then just 6, to show Athai what his standards of teaching were. So impressed was Athai with the little dancing Saroja, she immediately appointed the guru as the first dance guru of Kalakshetra. Rest is history. Few years later when Ram Gopal started his famous Bangalore Studio, whom did he call? The same guru and whom did the guru take along? Baby Saroja. She recalls, "Ram used to play badminton and the gurus assembled there (my guru Thatha; Sohanlal for Kathak; Vijay Raghav Rao for music) had nothing to do, so they all taught me instead!" While Ram, Mrinalini and Kamala learnt from Thatha, they learnt from other gurus and contemporaries like Meenakshi Sundaram Pillai and Ramaiah Pillai, too. MK Saroja learnt ONLY from Thatha, and thus remains his exclusive exponent. In the forties through the seventies, Saroja was a very sought after Bharatanatyam dancer, in demand on stage and in films too. Thus, three films with her classical dances were to become famous: Krishna Bhakti; Nalla Thambi and Paithiakaaran. Dandayudhapani Pillai was her singer and although he stammered while speaking normally, he was unparalleled when it came to singing and nattuvangam. His jatis were crisp, clear and classy. Sharp and spiffy and not a murmur of any speech defect. The guru and the singer would often carry the child dancer on their shoulder, when going performing from village to village. "Those days, all musicians and guru would line up behind the dancer on stage and my guru would often say, smile Pappu, smile! The sitting-on-side arrangement came with the proscenium stage, so seen nowadays. We dancers were Chinna Mellam artistes while singers-musicians were Peria Mellams, so we got secondary treatment." MK Saroja's turning point in life and dance came when Gemini Studios offered her a 7 movie contract in 1946. But Mohan Khokar did not let her accept it saying she would become more famous and perhaps not marry him! He had been pursuing her for long, having come from Lahore, where she had gone with Ram Gopal's troupe to perform. He came to Madras to learn at Kalakshetra and was its first male student from north India. MK Saroja married Mohan Khokar in December of 1949. She brought him good luck for, immediately, at the young age of just 24, he was offered and made the head of the first Dept of Dance at India, the MS University, Baroda. They left Madras for Baroda and spent 12 years there. The time spent in Baroda was full of Vaishnava culture. 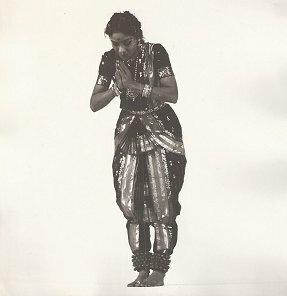 She was witness to first dance course being shaped at university level in 1950s and thanks to her Tamil background and previous associations, both E Krishna Iyer, Prof. Sambhamoorthy and other such luminaries trudged all the way to Baroda to lecture, be part of the non-existent dance scene in Gujarat. Her senior, Mrinalini had married Vikram Sarabhai and moved to Ahmedabad and established Darpana. Again, the same, common guru to both, Vidwan Muthukumaran Pillai was called all the way from his village Kattumannar to set the benchmark even in Ahmedabad. In Baroda, MK Saroja furthered her dance learning by learning Kathak from Sundarlal and Kundanlal Gangani, two illustrious brothers of the Jaipur gharana. Thanks to Mohan Khokar's vision of engaging traditional gurus in university level teaching, both were absorbed. Another mridangist-turned-nattuvanar, Kubernath Tanjorkar, was given employment and got a fresh lease of life. This was the fifties and classical dance, especially Bharatanatyam was hardly known, leave alone established outside its southern moorings. 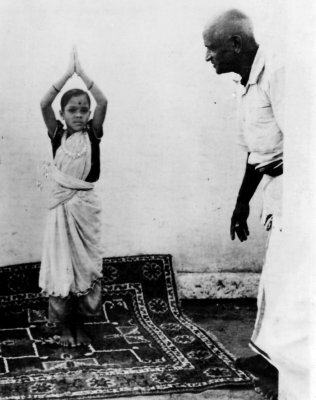 In Baroda and Delhi, MK Saroja danced and also slowly started teaching. Although she was herself not 25, she was teaching the art to grown ups like Nargis Katpitia, Pratibha Pandit, Laxmi Valrani and in Delhi in early years Indrani Rehman, Yamini Krishnamurthy, Lucia Maloney and Milena Salvini. After 12 years in Baroda, the couple shifted to Delhi, the capital city, where Mohan Khokar was appointed as Special Officer for Dance, placed at the then Education Ministry, at Sangeet Natak Akademi. Being in Delhi meant far wider opportunities and although her husband Mohan Khokar was very important in the dance world, he did not do much to promote her career, such was the couple's honesty and integrity. It was the various Chairmen and Vice Chairmens of the Akademi (KPS Menon, Kamladevi Chattopadhyay, Pula Deshpande) that wanted Saroja seen and made few opportunities, though she got the Akademi Award, 15 years after Mohan Khokar left the Akademi! At the Rashtrapati Bhavan (President of India's official residence) show for visiting King Sheikh Yemini of Saudia Arabia, the king gave her (and other artistes) a small bag (of gift) after the recital, attended by the Prime Minister, Indira Gandhi. Upon opening, it was found to contain a few gold coins! Promptly Saroja gave it to her husband, the acting Secretary of Akademi as it was a govt. organized function! Imagine an artiste turning in gold?! And promptly, Mohan Khokar deposited that with the ministry saying it was govt. property. Numerous such examples abound, some noted on Sangeet Natak Akademi official files. Flautist GS Rajan has seen and related some such files when he was at the SNA. In Delhi, her music team was Radha Krishnamurthy, a temperamental woman always demanding attention and being generally nettlesome. But her singing was strong and special, so Saroja had to depend on her for many years, before Meera Seshadri came into her life. 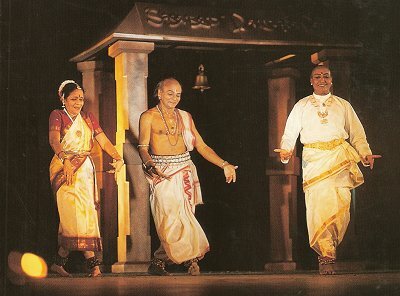 With Guru KJ Govindrajan as nattuvanar, TK Sankaran and later TK Murthy as flautists, Meera as singer and Dandapani as mridangist, Saroja's dance was strongly supplemented by able music. Many like Raja Reddy hold that after Bala amma, it is Saroja amma who represented the best in Bharatanatyam as both dance and music meshed and merged well and were of high standards. Many have respected her art. But the Khokars have paid some professional price for their integrity but they are highly respected and universally valued and admired for setting and maintaining high standards in dance. MK Saroja has four sons: Hariharan, an IAS allied; Nandan, a scientist-inventor; Ashish, dance critic-historian and Vivek in the hotel trade. She has 5 grandchildren in all, till date. But anyone who comes in contact with her becomes family for she is genuine, warm and affectionate to all. "Her smile is her best ornament," wrote Anjana Rajan in The Hindu (May, 2008). Two documentary films on her dance have been made in the 70s by the Theatre Dept University of Rome and one by Lamorisse in France. She has been a regular visitor to Mandapa in Paris, where since the 70s, she has trained students, and some of these are now training the next generation. Most of her students are like her: tradition-bound, maintaining margam format; and sticking to cultural contexts of showing real respect to guru, gift of gods and Saraswati's grace. Like MK Saroja, none are seeking fame or name and are devoted to art, not a reflection of glory for self through art. MK Saroja has always remained simple and humble in front of her guru and her audiences. There is no one who talks ill of her in any city. She has a genial personality, is always smiling and warm hearted. She does not know the cunningness to survive and be in the news; the smartness to use what she has achieved, professionally. She remains a quintessential bhakta of Bharatanatyam and has quietly served her art. Among the over 200 students she trained in Paris, where she taught every summer for almost 30 years from 1970-2000, Vidya ranks majorly while Jyoti, Ambika, Sylvia, Edith, Shalini, Shanti (all took Indian names! ), continue her art. In India, while many senior dancers learnt specific items from her, those who learnt properly and regularly are Shobana Radhakrishna, Rasika Khanna, Arup Ghosh - Sylvia. No Padma award has come her way but in dance fraternity, she is respected and valued by all, especially those who have seen her in her active years. A true artiste, she took active leave of the stage after her husband and singer both died. She muses at her muse, sitting in her house by the seaside in outer Madras and looks at almost 80 years, 75 of which is in dance, amusingly, with no ego and no attachment. 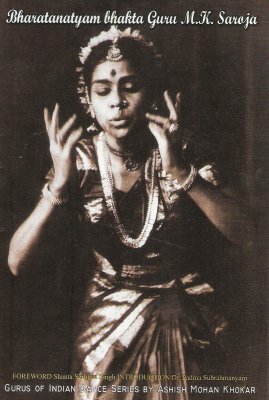 MK Saroja is thus a true bhakta of Bharatanatyam. Ashish Mohan Khokar is a reputed full-time dance writer, critic, historian, editor and publisher, with 35 published books to date. He has served many art organizations earlier at state, national and international levels. He is on boards and committees, but only speaks truth and promotes true artistes. His low-key persona is part of his DNA, as is dance.